The Drexel University Police Department engaged its new officers in a rigorous training exercise Jan. 29, aimed at preparing officers for the possibility of an active-shooter situation. New tactics that encourage a speedier and more direct approach to neutralizing the situation have been in practice since the Columbine massacre of 1999. “Columbine was a terrible tragedy, and the police realized we needed a better approach in terms of training as to how officers deal with an active shooter,” Lt. David Caristo of the Drexel University Police Department said. With the new approach, the police response team aims to be more aggressive and streamlined. “The active shooter is basically somebody armed with weapons, actively shooting and killing people. We can’t wait, we are not going to wait, we are not going to waste any time rendering first aid, we’re not going to set up perimeters, we are not going to evacuate. We are going to charge in, in teams of two or more, and we are going to go in and we are going to stop the active shooter, unlike other incidents that the police deal with day in and day out where we would use a more traditional approach,” Caristo said. 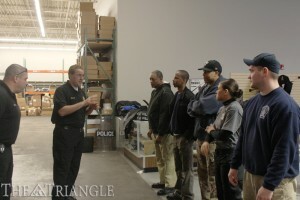 The procedures for first aid were some of the hardest parts to adapt to in the new officers’ training. “Police officers have always been trained in any type of traditional situation to render aid, first aid, to assist people. We don’t do that . . . in an active shooter. In an active shooter, we jump over injured people, which may be difficult for many police officers because we have been trained never to do that, always render first aid first. . . . And the reason being that as long as this shooter is active, we are just going to keep piling up injured people. So we need to go after the shooter right away,” Caristo said. According to Sgt. Fernando Santiago, this training consists of both classroom learning and simulations with mock ammunition, and it does not just apply to school shootings. “They are very dynamic, it’s fluid, it can go from something as basic as a domestic. Let’s say we have an employee or someone that has an issue with a loved one, and that person comes into the building with a weapon. It’s the same response. If that person were to begin to hurt people, this is how we would deal with it,” Santiago said. 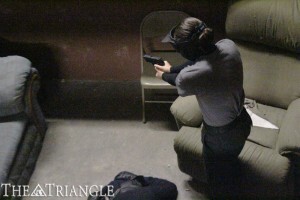 Training included multiple phases that police would have to perform in the event of an active shooter: communication, identifying a threat, entering buildings, movement formations and execution. This training will be conducted once each year, and every police officer entering the department will have to take the course. In addition, larger multijurisdictional training will occur between Southeastern Pennsylvania Transportation Authority Police, University of Pennsylvania Police and the Philadelphia Police Department to keep all units up to date.